Shuffleboard powder lets the puck slide smoothly across the board. Shuffleboard powder is made from a combination of Dried Silicone Beads and Ground Corn (Corn Meal). Shuffleboard wax is a confusing term, as it is actually powder and not liquid wax (as in the maintenance kit). In the old days, people used saw dust. The new products are silicone beads and ground corn meal. When you want to increase the speed of your shuffleboard game, you try to decrease the amount of friction between the puck and the surface of the shuffleboard. To decrease friction, make sure you clean and polish the wood or laminate to remove grit, grime, sweat, and oil. After the board is clean, put a liquid wax on your table. See our maintenance care tips. 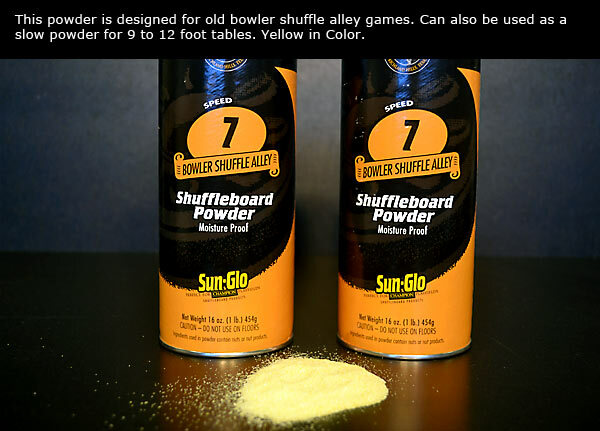 After liquid wax has been applied, the next step is to find that special shuffleboard powder for your table. Shuffleboard powder, or wax, comes in different ratings of speed. This is because an increase in speed sacrifices control. If you find the puck is flying so fast across your field it looks like a blur, try a slower wax. ZieglerWorld Gold Sand Faster! Fast! ZieglerWorld Yellow Sand Medium Fast! Slower! Need Help Choosing the Right Powder? View Our Informative Video! 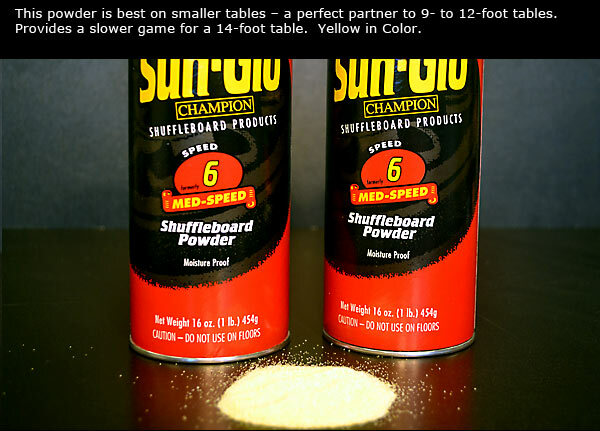 Shuffleboard powder, or wax, comes in different speed ratings. 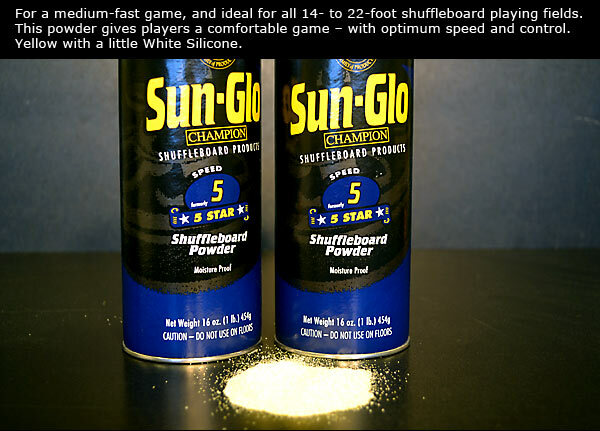 Today we are going to compare Sun-Glo’s 8 different speeds of shuffleboard wax. Shuffleboard powdered wax is really a confusing term and we can get mixed up with shuffleboard liquid wax which you put on a table as a base. Shuffleboard Powdered wax- sometimes called dust or sand is made to allow the puck to travel down the board. The most Super Fast powder around! Pure silicone ball bearings. This powder gives you the game with the most challenge. Finesse and touch is the key to winning with this powder. This powder is designed for the professional player. 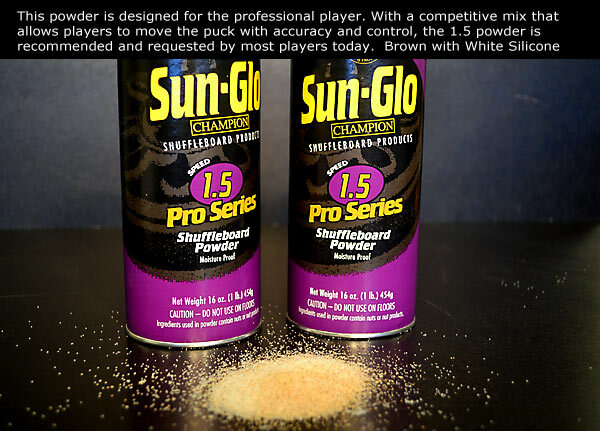 With a competitive mix that allows players to move the puck with accuracy and control, the 1.5 powder is recommended and requested by most players today. 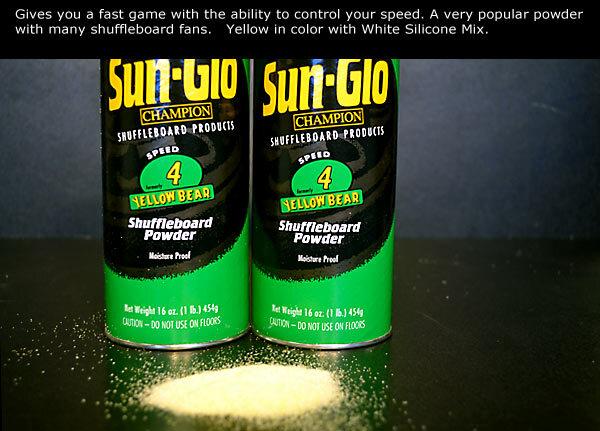 This powder gives you speed and control as well as a faster game (but not the fastest). 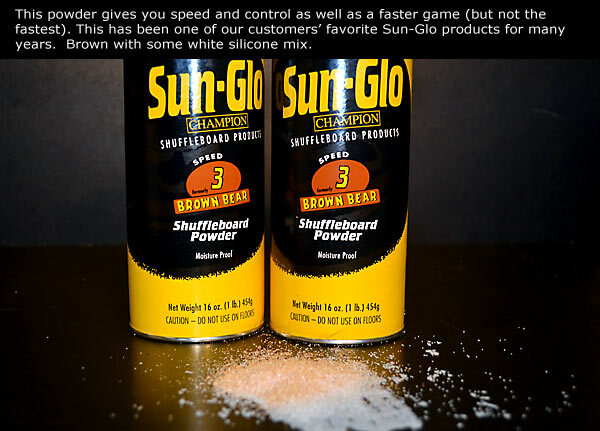 This has been one of our customers’ favorite Sun-Glo products for many years. Gives you a fast game with the ability to control your speed. A very popular powder with many shuffleboard fans. For a medium-fast game, and ideal for all 14- to 22-foot shuffleboard playing fields. 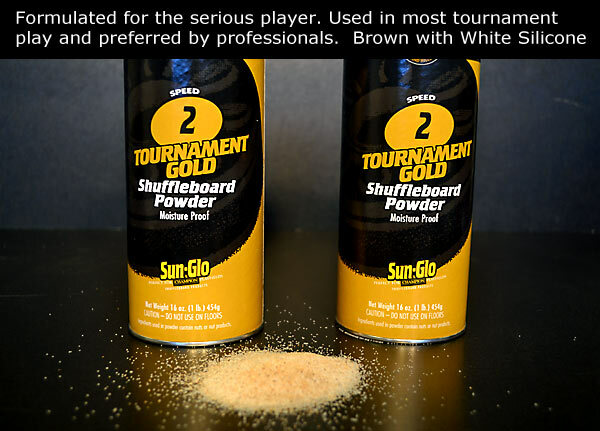 This powder gives players a comfortable game – with optimum speed and control. This powder is best on smaller tables – a perfect partner to 9- to 12-foot tables. Provides a slower game for a 14-foot table. This powder is designed for old bowler shuffle alley games. Can also be used as a slow powder for 9- to 12-foot tables. If you find the puck is flying so fast across your field, it looks like a blur, you can try a "slow" wax. When you need that boost in speed, upgrade to a "fast" wax. These ratings aren't universal, but Sun-Glo’s easy numbering system allows you a means for comparison. One item to consider – the lower the number speed the faster the wax. 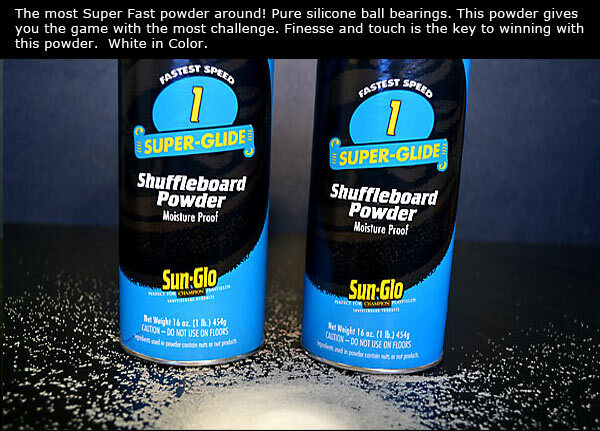 The number 1 speed is pure silicone ball bearings where the slowest speed -- #7--- resembles talcum, cornstarch, or confectioner's sugar on the board.